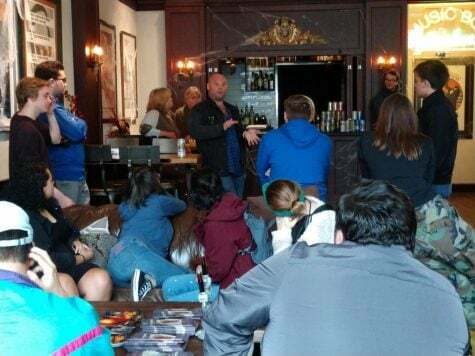 “I don’t think you can hype this movie up enough,” said DePaul directing, theory and cinema production professor Andrew Stasiulis as he kicked off a post-screening discussion of the classic monster movie “The Invisible Man” with his students and few other patrons in the Music Box Lounge. This screening and discussion are part of Stasiulis’ class DC 370/470 Advanced Topics in Cinema – Universal Horror Films: Monsters, Madness, & the Macabre. In addition to usual lectures, the class meets at the historic Music Box Theatre throughout the month of October to watch classic monster films on the big screen in glorious 35mm for a “unique classroom environment,” according to Stasiulis. The idea for this collaboration was not initially focused on Universal horror films. Stasiulis’ original idea was to have a class about World War 1 cinema in honor of the centennial of the armistice. The class meets on Monday nights to discuss the productions, the legacy, the influence and all the contextual factors of the times these monster movies were produced. Stasiulis, however, doesn’t want the class to be a typical lecture; he wants it to be a full, student-led discussion. Two students that are a part of that conversation are Megan Henning and Farouk Kannout, who were drawn to the class out of their admiration for both Stasiulis and the Music Box. “I like the way Andrew teaches and I’m into talking about movies politically and philosophically and whatnot but it’s also just a really good excuse to go to the Music Box,” jokes Kannout. If there is one thing that Stasiulis wants his students to take away from the course, it is an admiration for history and the influence it has had on where cinema is today. The Music Box helps him get that point across. Chicagoland residents can participate in this deeper understanding of the classics with a screening and discussion of “Frankenstein” on Oct. 15 at 7 p.m., “Murders in the Rue Morgue” on Oct. 20 and 21 at 11:30 a.m., and “The Mummy” on Oct. 27 and 28 at 11:30 a.m at the Music Box Theatre.